My own addition of human ship images, based on ones I made from Star Blazers and some of Kathaniel’s models. 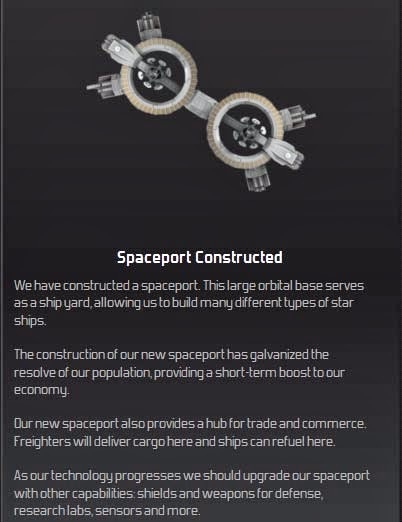 The first order of business is to build a spaceport and a construction ship. 2100.07.22 Olympia Space Port is constructed. 2100.10.18 The first exploration vessel is built, and is sent to Sol 2 to explore it, as well as the abandoned frigate in orbit around it. 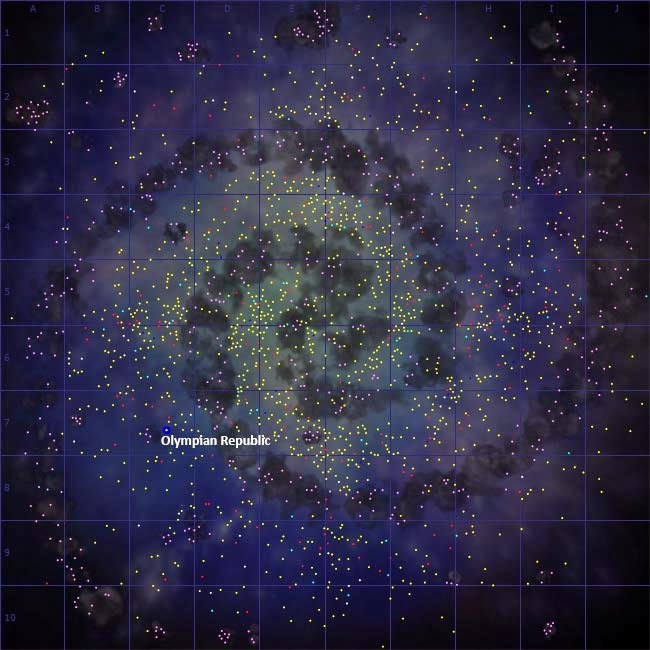 Information discovered on the frigate points to a location very close to the Sol System, just over in the next sector. If the Olympians discover faster-than-light travel, it will be a top priority to investigate this location. The frigate is ordered back to Olympia Space Port for study. 2101.03.12 By now all three research stations are completed, and work on a gas mining station at Sol 2 is progressing nicely. 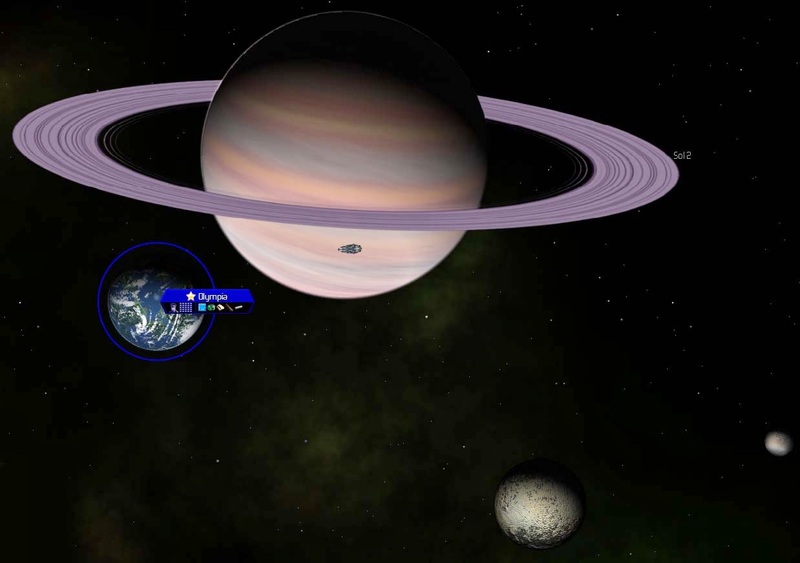 The Exploration ship is well on its way towards exploring the other planets in the system. The private sector is building ships with a vengeance, with 11 built and 5 more on the way. 2102.02.20 Hyperdrive technology is discovered. The research teams begin work on this immediately. 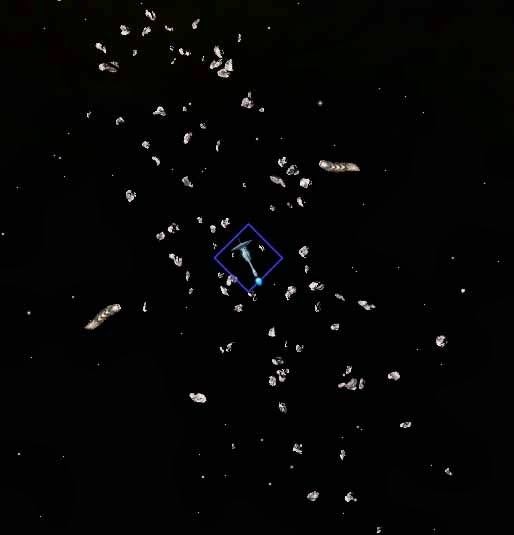 Exploration of the Solar System has turned up multiple resources in various locations, so two more construction ships are queued up to build mining stations. 2102.09.26 The Exploration ship EX-01 charts a dangerous course through an asteroid field, maneuvering to evade a pair of hungry space slugs. 2102.11.14 First Contact. An independent trader has arrived in system. Simply due to the ruins discovered within the Sol system, it was known that alien life existed, confirming the old legends. Now there is definitive proof that alien life exists and is thriving. 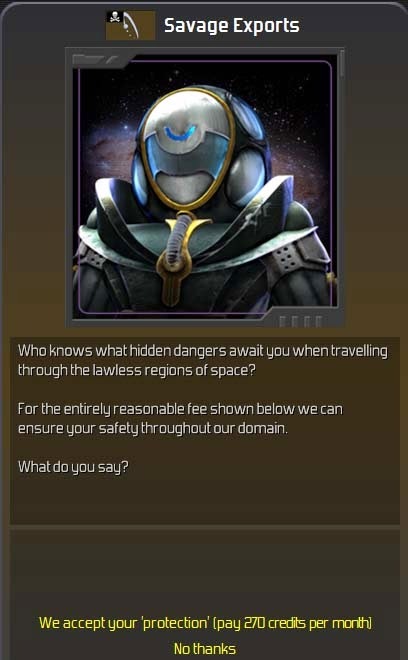 In addition to invaluable intelligence about the state of the galaxy, the trader also warns of pirates. Thus far Olympia has not worried much about defense, so this information is disconcerting. The construction of some warships is considered. 2103.03.27 With the recent breakthrough in Concussion Missiles, the Senate orders two corvettes to be built. They are small, slow, short-ranged, and underarmed, but they are something. For the most part they are designed to protect Olympia itself from any attackers, as they are far too slow to defend anything else. 2103.07.12 Apparently the two corvettes, Ikazuchi and Inazuma, were constructed just in time. 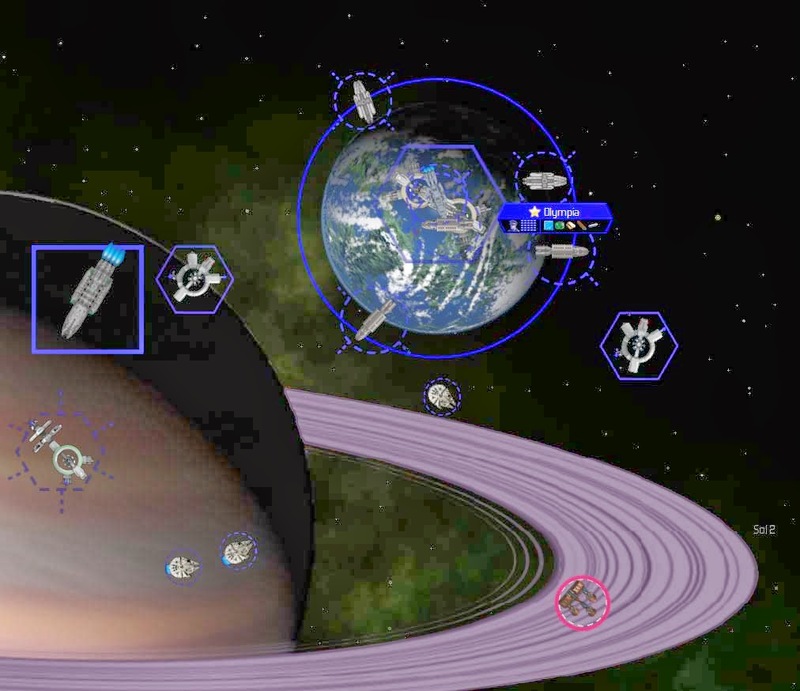 A pirate exploration vessel, Outrageous Shroud, arrives in system near the asteroid belt. The pirates call themselves the Savage Exports, and are apparently smugglers. They will be watched closely. Soon after the pirate explorer arrives, it hypers away. 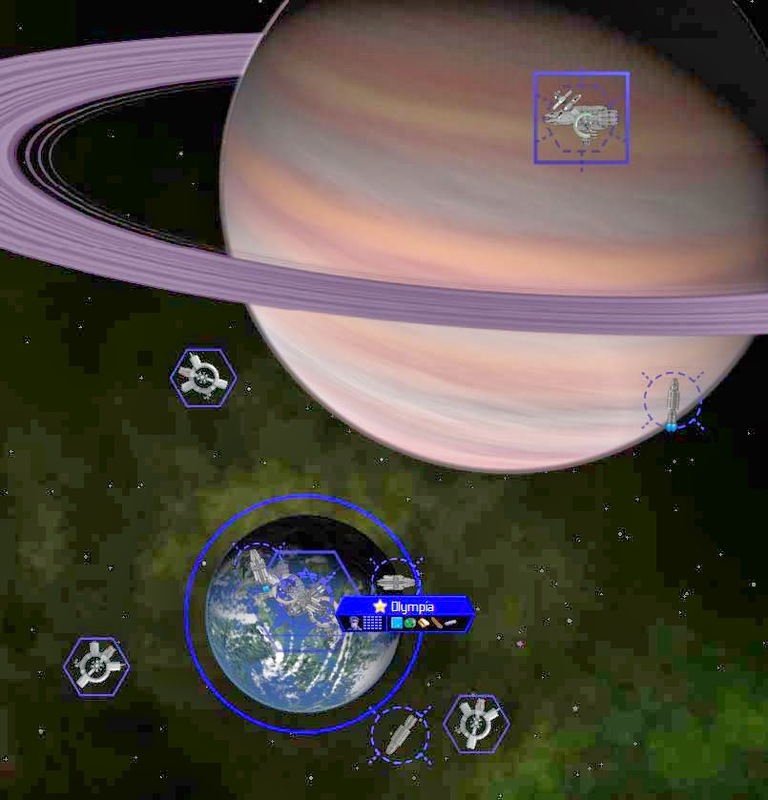 2103.11.20 The Savage Exports offer the location of an independent colony...for 20,000 credits. This seems excessive, and some in the government argue that it’s practically extortion. There seems to be no way to independently verify the information, and seeing as they are, well, pirates, they do not seem very trustworthy. Olympia passes on this one. 2104.01.14 Ever since the discovery of the “Ancient Monolith of Sol” on the otherwise barren rock planet Sol 1, the citizens of Olympia have been demanding that a resort facility be constructed there to cater to the elite of society. Acceding to the demands, the President Okkuros cancels other worthy research projects and funnels effort into researching Entertainment Systems. 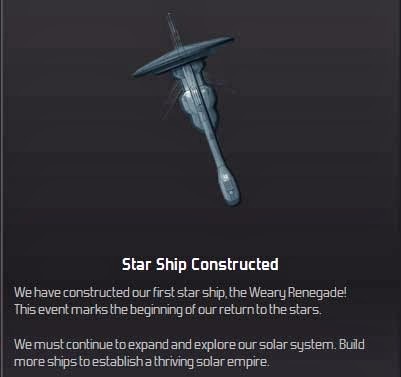 Now completed, leading architects present their designs, and a construction ship, aptly named Sol Enterprise, is dispatched to construct the winning design. 2104.07.26 Research into Armor Plating is complete, and the two corvettes are sent one at a time to refit. 2104.09.19 Savage Exports have finally gotten around to threatening the Olympian Republic. Their fee is entirely affordable, but the Senate refuses to pay. Confidence is too high in the Navy and recent technological advances, so instead, the money is spent on a warship. Actually, the equivalent of nearly a year’s worth of “protection” from Savage Exports is spent on the frigate. Critics of the policy express their guarded hope that it is worth it.